A person’s sense of proportion in creating a house to suit his own lifestyle can have energizing results. 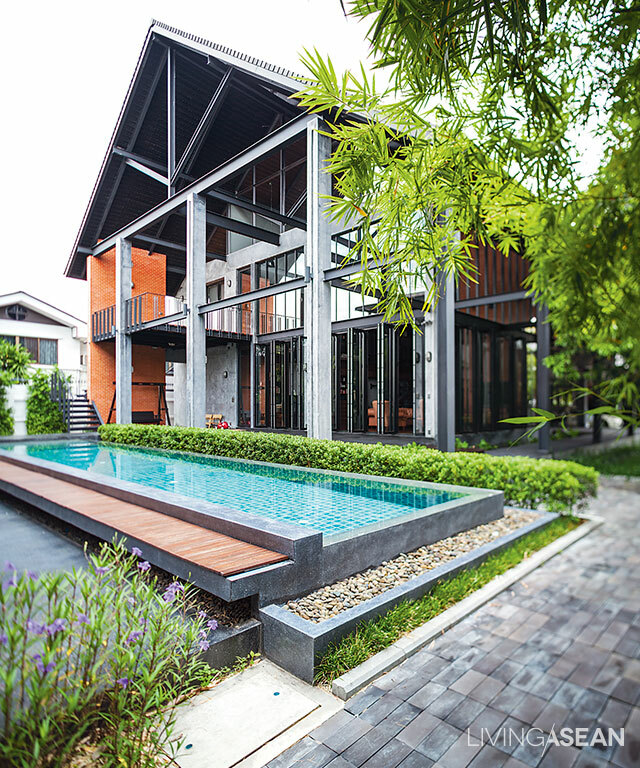 Here we visit a modern style home in Bangkok’s Viphavadi Rangsit area that illustrates this. 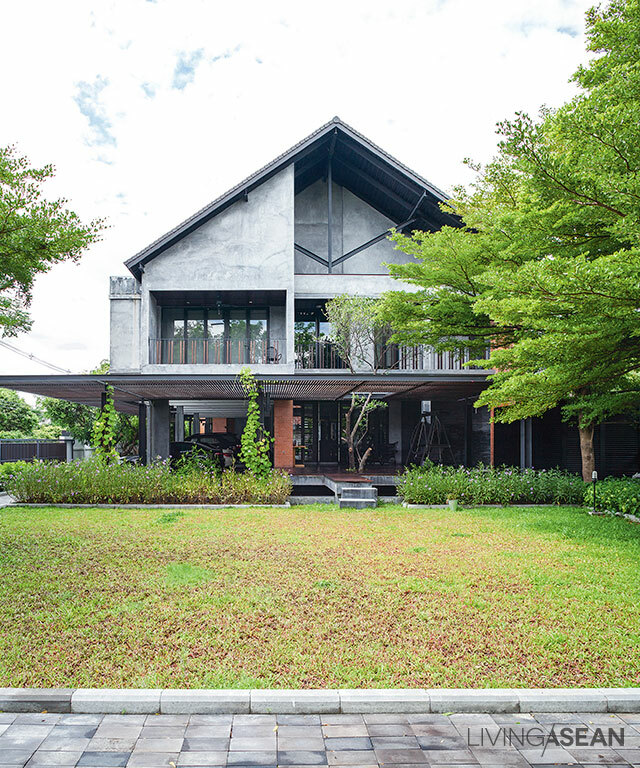 Nutt Chenyawanit, owner of Tin Home Toy merchandise, designed this house as a reflection of his identity. 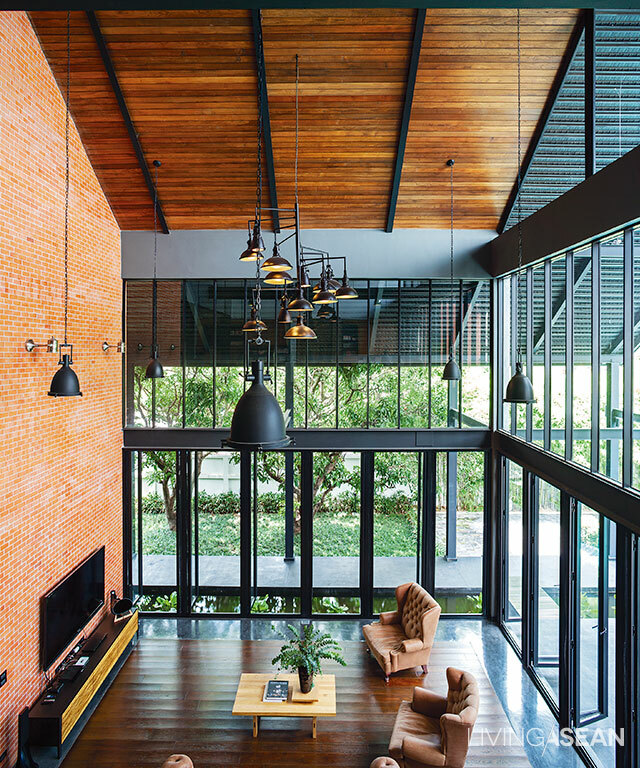 A high gabled roof and bare concrete surfaces set at varying depths for a modern look. 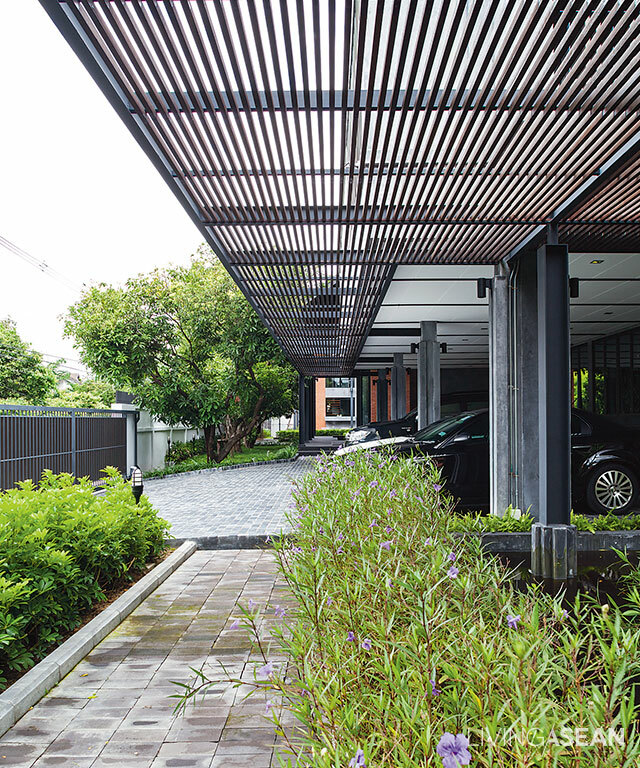 The carport beneath an effective and attractive latticework awning that blocks sun and rain. 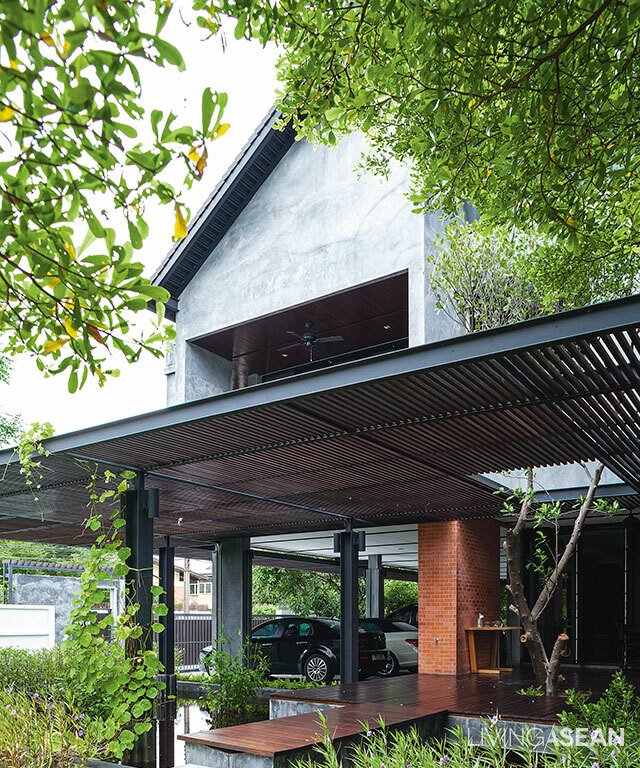 The main house entrance has eaves reaching out 4 meters, both esthetic and practical. The Tin Home Toy office building next door, built in a similar style, was here before the house and now is separated from it by a swimming pool. 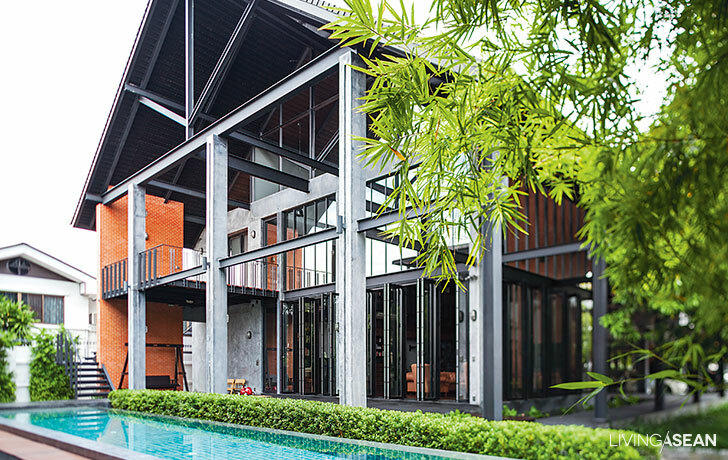 Nutt favors architecture with steel-based frames that give it a raw cool modern style. 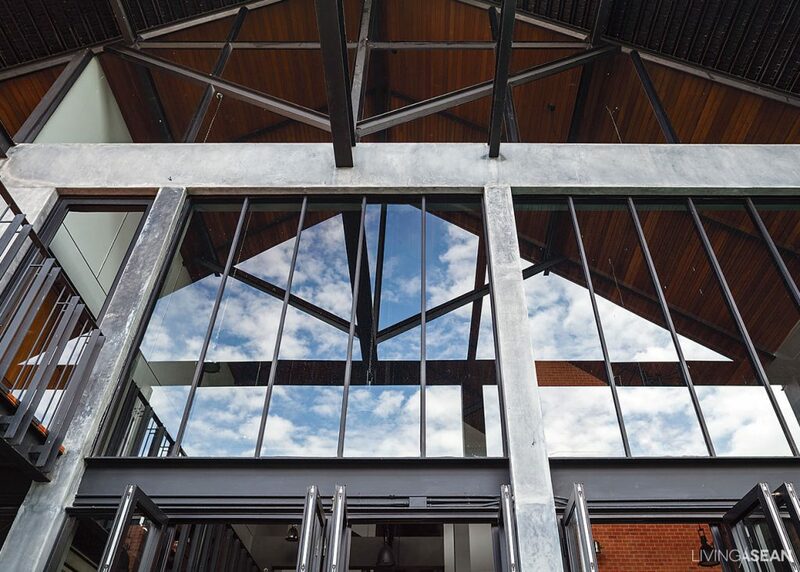 The metal post-and-beam design for floor and roof here made for rapid construction and quick cleanup, and presents a stylish façade of show brick walls and glass panels. Next to the garden a metal-frame eave filters sunlight above a rest area, keeping it cool and comfortable even in bright sunlight. 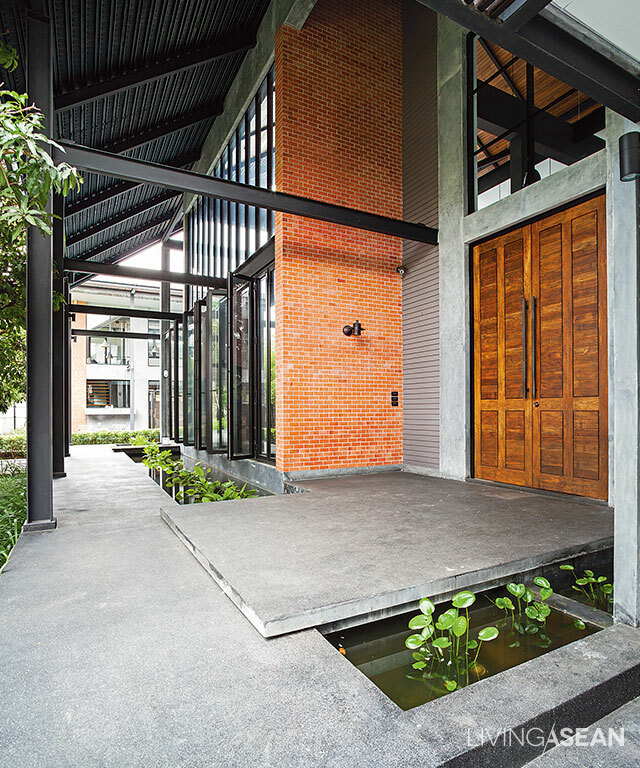 The walkway around the house is set out in straightforward lines using low-maintenance materials such as brick. Extended eaves and large doors and windows provide good ventilation and help the house to be comfortable for living. Metal frameworks minimize the need of support posts for the extended eaves, freeing more space for parking. High ceilings allow warm air to rise and be released through upstairs windows. The different textures of metal, glass, concrete, and wood mix and match well. 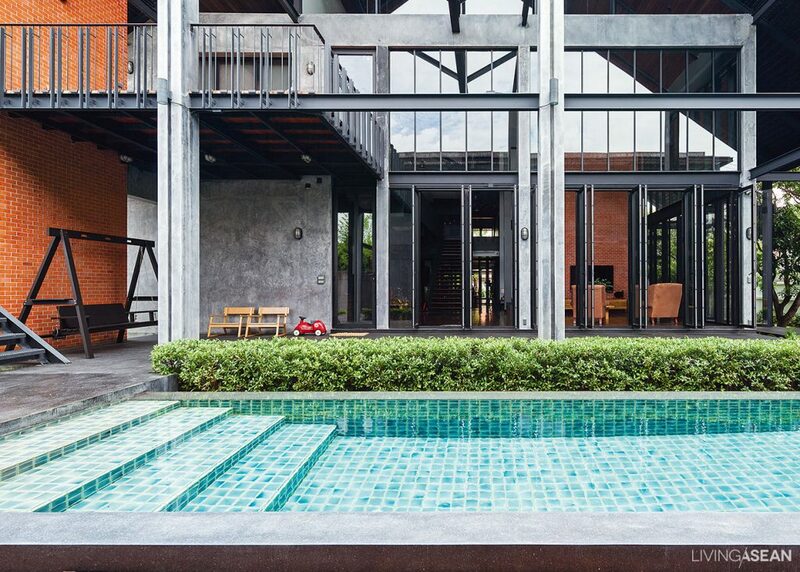 The swimming pool is a great feature, beneficial for both home and office. The high-ceiling living room is open wide on two sides to catch the sun so artificial light isn’t needed. Usable space in the house on the ground floor is made up of living room, stairwell, dining room, kitchen, and service areas like a storeroom and laundry. Upstairs consists of bedrooms and a workroom. Halls are at least 2.5 meters wide, for a spacious feel. Walking around, a visitor has the sense that each space is made for specific purpose, some for children, some for moving around in comfort, some for convenience. Old-fashioned shelving at the far end of the living room reaches up to the mezzanine. 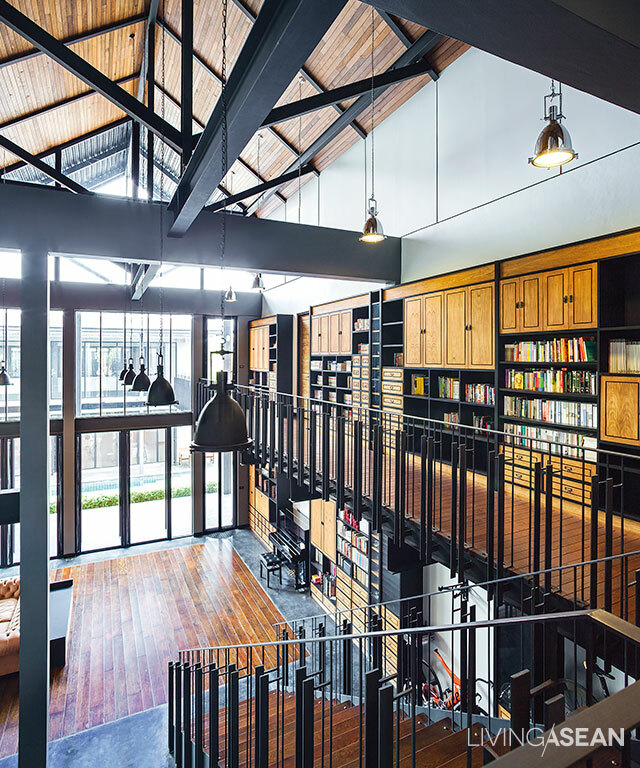 Although the ceiling is really high, it has a horizontal dimension, too, as the mezzanine is filled with built-in cabinets and bookcases. 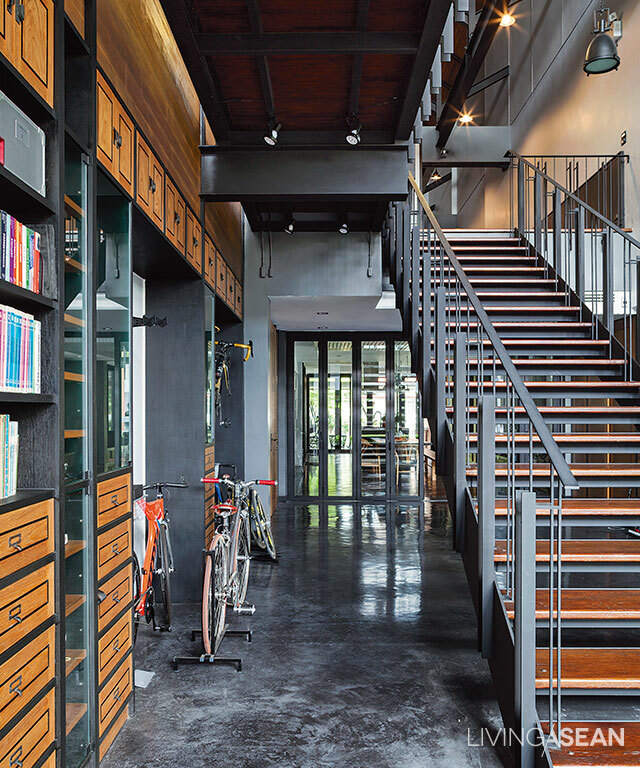 A small storage space by the stair for bicycles gives a hint about Nut’s spare time activity. 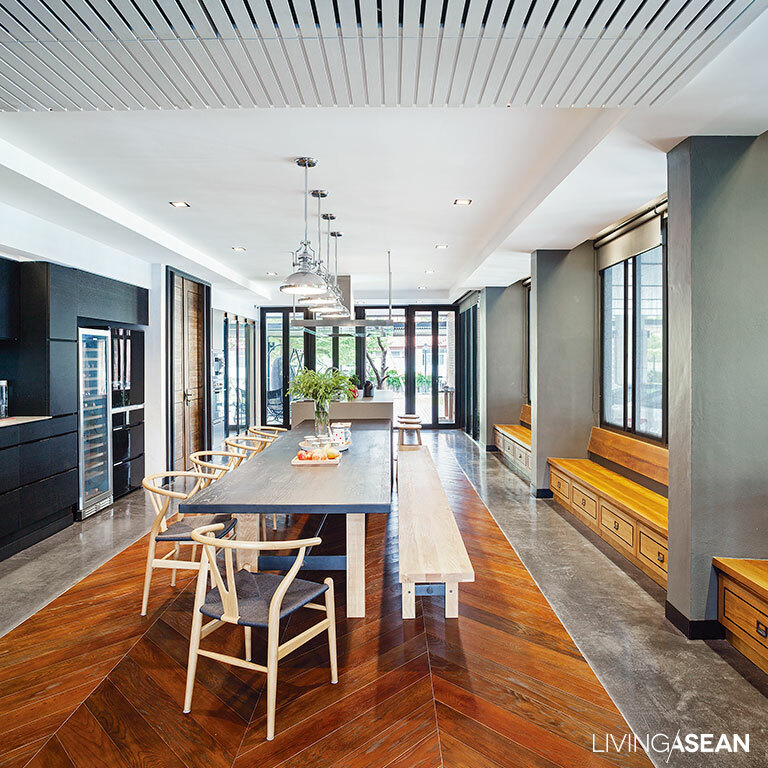 At first glance, a visitor might have questions about the house design, but a close look reveals a “set aside” concept that reflects the way good decisions are made in all our lives. Standard ways of doing things have a potential to limit flexibility and result in mediocrity, whereas innovations such as high ceilings can bring the sort of happiness and contentment we find in this house. The master bedroom is simply decorated in white and wood colors and opening out to the garden. Bedroom with window opening into the bathroom: open, relaxed, and good ventilation. 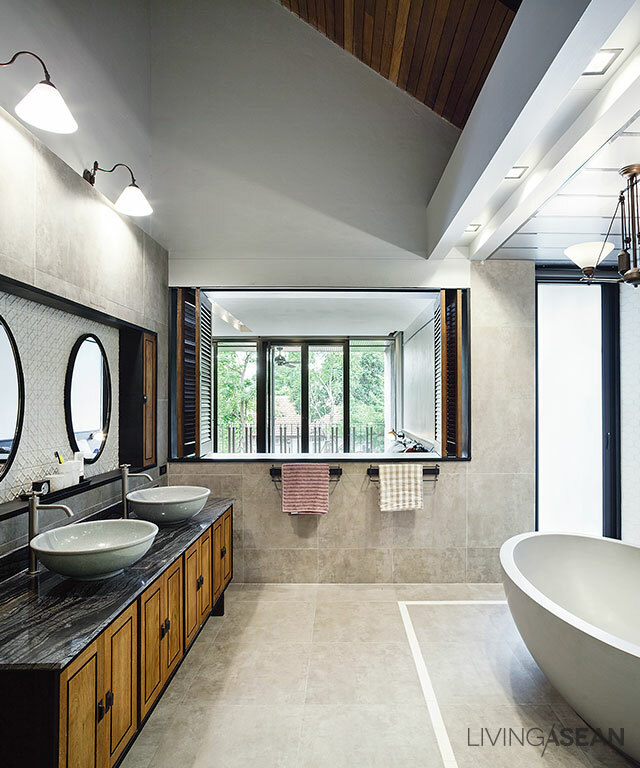 Ceiling follows the roof slant in this relatively large bathroom area. Wooden shutters open directly into the bedroom. One side of the dining room is a food preparation area; on the other a line of windows looks out on the carport.